So who are the Apron Activists and what do they do? We’re glad you asked. 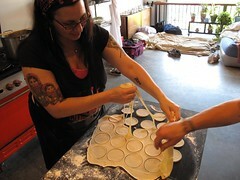 Apron Activists is a group of vegans in Portland, Oregon, who use their love of food and cooking to help save animals and promote animal rights. We host gourmet, vegan, four-course dinners, sell tickets, and the proceeds are given to a selected shelter or non-profit. By focusing on local groups that directly help animals, we hope to make a difference the community can see and feel, as well as to inspire and encourage involvement in the vegan and activist community. We also know that for many people, they want amazing vegan food to be their activism, and they will pay for it. We will provide. Four courses for causes. Founded by chef and bestselling cookbook author Isa Chandra Moskowitz (Veganomicon - The Ultimate Vegan Cookbook, Vegan Cupcakes Take Over the World, Vegan With a Vengeance, Vegan Brunch and the forthcoming Vegan Cookies Invade Your Cookie Jar.) and Michelle Schwegmann, co-founder of The Herbivore Clothing Company, Apron Activists is also a great excuse for us to talk about food, plan menus, buy animal tchotzkes, etc. It’s just what we do. Of course, nothing could happen without the wonderfully generous Lisa Higgins of Sweetpea Baking Company in Portland, Oregon, who hosts our dinners at her wonderful bakery. And all the dedicated folks who show up to chop, dice, serve, pour, smile, and then clean up the mess. Justin, Chad, Heather, Katie, Audra, John, Kimmi, Emiko, and Josh. It is a crew made of love.